Seeking an injury-free fitness regime sans crowded classes? Look no further than Sensible Fitness, a new, boutique fitness enterprise tucked into a charmingly-repurposed garage in Concordia. In the studio, watermelon-washed walls and abundant skylights provide a cheerful, light-filled ambiance. Brightly-colored floor mats and hand weights of various poundage are scattered about – inviting their use. Toby, the owner’s dog, watches from a corner, his tail wagging gently. 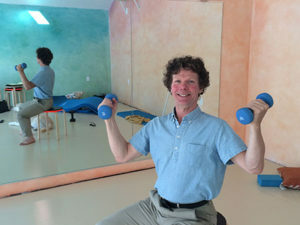 Proprietor Chris Pike is no stranger to the business of exercise. Using a science-based approach, he ran his fitness program under a different name for six years in Davis, California. A medical condition exacerbated by too much sunshine led him to relocate to Portland this year. Because he’s committed to sustainability, he chose the Concordia neighborhood. “I don’t own a car, and I bike or walk everywhere, so this neighborhood works out perfectly for me,” Chris said. His Sensible Fitness program uses a blend of strength training, stretching and movement to provide class participants – there are six maximum per class – a full range of exercise. Chris’ program incorporates elements from yoga and Pilates as well as ballet and African dance. Former Davis client, Ellen Dean, is a die-hard Chris fan. She now leads a group in Davis that continues to meet to exercise according to the program he taught them, using a CD with Chris’ voice and his music. “Chris is a very talented teacher with a lot of knowledge about body mechanics. He could be famous for his routine, but he isn’t someone who brags or puts himself out there in a competitive way,” she said. Kylie Mendonca, also a former class participant from Davis, learned Chris had moved here and looked him up so she could go to his Portland studio for workouts while she was on an extended summer visit. Now she is gearing up for a move here. “Chris is so sweet. He makes an effort to learn people’s names, and he pays attention so he can help those who might need help with the poses. And you really see results from his classes – not only do you feel strong – you look fit,” she added. Chris does what he loves. Although he earned a Ph.D. in physics, he has invested an enormous amount of time learning the art and science of fitness. Sensible Fitness classes, appropriate for participants of all genders and fitness levels, are offered at 10 a.m. and 6:30 p.m. daily by reservation. Prices vary depending on class size, and $15 for a single session. Private or customized small group classes are also available. For a class schedule and to sign-up visit SensibleFitnessPDX.com, or contact Sensible Fitness by at info@sensiblefitnessPDX.com or 503.757.6656.